Oregano adds the familiar fragrance to a Greek salad, but it also provides relief for a sore throat. Olive oil is an essential component of Greek cuisine, but it’s medicinal, too. 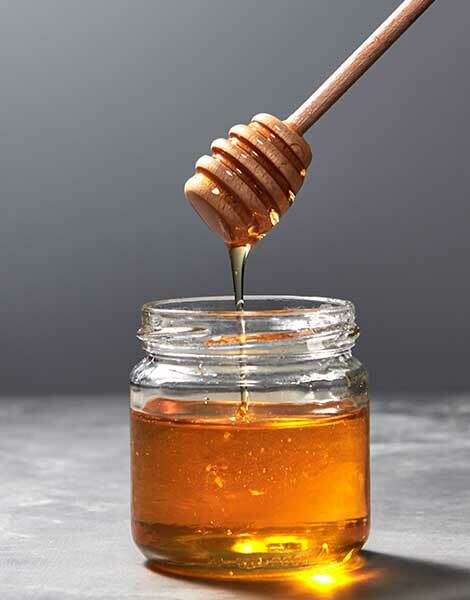 Honey is a sweetener that also contains more than 180 nutrients. Ancient Greek gastronomy, the forerunner of the food culture of Rome, is the source from which many features of the diet and cuisine of Europe are derived. But that’s not all. Ever since antiquity, the Greeks haven’t just sought to satisfy their hunger or to find enjoyment in foods. Many foods were used to prevent or treat a number of health conditions. Its official botanical name is in fact Salvia officinalis, which is partly derived from the Latin verb salvare, meaning “save,” and alludes to its therapeutic properties. The ancient Greeks used its fresh leaves to treat wounds and snake bites, and as a drink to enhance female fertility. As a beverage, sage-infused “Greek tea,” as the French call it, or “Greek sprout” for the Chinese, remains popular to this day, either on its own or combined with other aromatic herbs. Sage is also associated with some less scientific benefits. In Syros, for example, they say it exorcises gossip. You will often find little bunches of it hanging outside homes. A beneficial herb, sage has anti-catarrhal properties (for asthma, bronchitis and coughs), as well as anti-fungal and anti-infective action (for flu, gingivitis and insect bites). It is an effective antispasmodic (in cases of dysmenorrhea) and healing agent. Its broader effects include stimulating the nervous system, improving memory and boosting blood circulation, while its antioxidants act against free radicals. In bygone times, homemakers made full use of everything the Greek soil yielded up. This is how moustalevria, a dessert that dates back to antiquity, was born; during the Byzantine period, it was called moustopita and was made with flour and boiled grape must. That is more or less the recipe that survives today, though it is now embellished with nuts and cinnamon. Moustalevria is a highly nutritious food, thanks to the main ingredient – grape must – which provides a large quantity of antioxidants. With the addition of walnuts, almonds, cinnamon and sesame seeds, it is enriched even further, not only in flavor but also in nutrients. Sesame seeds are rich in amino acids, minerals, trace elements and calcium. Cinnamon balances glucose levels in the blood, while walnuts and almonds provide valuable omega-3 fatty acids, antioxidants and phytosterols. What’s more, this dessert is relatively low in fat. 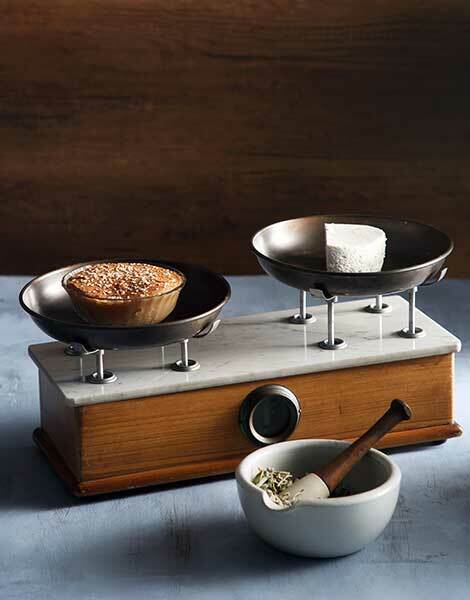 According to Greek mythology, knowledge of cheesemaking was gifted to humans by the Olympian gods through Aristeas, son of Apollo. There are references to cheese products in the writings of Aristotle and in the comedies of Aristophanes, while Homer famously referred to them in the Odyssey as well, citing the cheese made from goat’s and sheep’s milk by the giant Cyclops Polyphemus, eventually blinded by Odysseus. Could this cheese have been anthotyro? It is quite possible. Soft, white and rind-less, anthotyro is made in most regions of Greece from whey (left over from making other types of cheese) and sheep’s or goat’s milk, or a combination of the two. Lightly salted, it combines a pleasant flavor with high nutritional value, providing all of the substances that dairy products offer (protein, calcium, potassium, phosphorus), but with less fat, and at just 200 calories/100g. Compare that to 470 calories/100g for graviera, 420 calories/100g for kefalotyri, and 350 calories/100g for feta. Anthotyro is served as a side dish with meals and used in savory pies and salads or as a spread on bread. It pairs deliciously with fresh fruit and nuts, and makes an excellent dessert when topped with honey. Avgotaracho (bottarga) – also known as “Greek caviar” – is made from the eggs of the gray mullet fish (kefalos, or bafas, in Greek), and ranks among the best Greek delicacies. Avgotaracho is a protected designation of origin (PDO) product, and is produced in the area of the lagoons of Messolongi-Etoliko (the “beauteous lake,” as Homer referred to it), Kleisova and Bouka. The most common way of preserving it is by dipping and encasing it in a coat of natural beeswax, which prevents contact with the air and lets it keep for several months. Both the ancient Greeks and the Byzantines – who called it oiotarikhon – regarded it as a fine delicacy. Avgotaracho is of great nutritional value, as it is a potent source of protein, vitamins, iron, calcium, selenium and zinc, as well as omega-3 fatty acids, which are vital to our bodies and linked to good cardiovascular health. It is served cut into very thin slices (after first having been kept at room temperature for at least an hour, in order for it to soften) or grated on top of bread or even in salads, risotto or pasta dishes, to which it offers its delicate flavor. It can be accompanied by a glass of ouzo or tsipouro (a pomace brandy). The history of apiculture, or beekeeping, in Greece goes back thousands of years. Excavations at Phaistos uncovered ceramic beehives from the Minoan era (3400 BC). Hippocrates recommended honey to all his patients; eaten with bread, it was the main food for Pythagoras and his followers. Frequently, the libations to the gods included honey with wine and milk, while ambrosia, the food of the immortals, was said to contain royal jelly. In classical times, desserts with honey were very popular, including honey pies called melitoutta, and plakountes, which also had sesame seeds and spices. With more than 180 nutrients, honey is a food of high nutritional value. It is an excellent source of carbohydrates, antioxidants, B-complex vitamins, trace elements and minerals (calcium, magnesium, zinc, iron, copper) necessary for keeping the body in balance and contributing to everything from bone strength to a healthy metabolism. It has a lower glycemic index than sugar; in small quantities, it is even suitable for people with diabetes. The great biodiversity of Greece – 1,300 endemic plants and an exceptional variety of flowers, herbs and trees – also affects the quality of the honey produced in the country: it is far superior in flavor, aroma and density than honey from other countries. 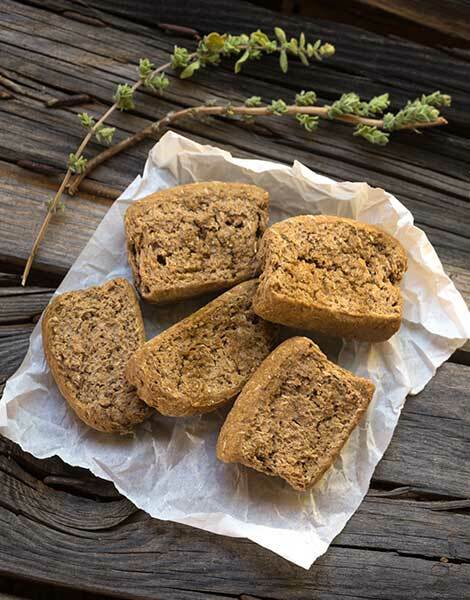 The ancient name for rusks was dipyritis artos, or “twice-baked bread.” Rusks have been a staple of the Greek diet for millennia before refrigeration or preservatives, as a way of keeping bread for as long as possible was needed. Rusks, particularly those made with barley (which does better in the Greek climate than wheat), are a good source of vitamin B complex, selenium, potassium, calcium, phosphorus, silicon (to help rebuild and protect bones), chromium (for better control of glucose levels in diabetics) and dietary fiber (especially beta-glucan, linked to lower cholesterol). They also aid in better intestinal and liver function and help reduce cellulitis. What’s more, barley contains less gluten than wheat. So, try barley rusks instead of your breakfast toast (or even forego commercial breakfast cereals, with their hidden sugars, for boiled barley, honey and cold milk). And remember that, because their low moisture content eliminates the risk of microbial spoilage, rusks don’t contain any preservatives, either. According to gastronomic history, modern-day trahana has evolved from a porridge-like mixture of milk and wheat eaten by the ancient Greeks and Romans. The noted gourmet and recipe collector Apicius (1st c. AD) refers to this food substance as tractae. In Byzantium, it was popular as tragos or traganos. In the past, it was a practical method for using up leftover milk and was critical to a family’s survival – trahana could be stored for more than a year in a cool place. Trahana is made with milk that has soured, to which wheat is added. The wheat can range from coarse to fine – Cretan xinohontros, for example, uses coarse wheat. Trahana is rich in carbohydrates and is also a source of fiber, which aids intestinal health. The lactobacilli in the sour milk have a beneficial effect on the digestive tract, too. Trahana contains protein, magnesium, iron, phosphorus and calcium in a form which the body can easily absorb. It also has carotenoids, such as lutein, a powerful antioxidant that works to prevent the harmful effects of free radicals, thus helping to maintain eye, skin and heart health. Trahana can be made into a thin or thick soup which is low in calories (100 calories/100g). It can be added to savory pie fillings or used in stuffed vegetables or grape-leaf dolmades instead of rice. Raisins are among the most ancient of agricultural products of Greece, having been cultivated since Homeric times. Corinthian raisins are small and with relatively little flesh, but offer an impressive wealth of nutritional constituents, antioxidant elements and other trace elements, which can fortify and safeguard our bodies against a host of illnesses. 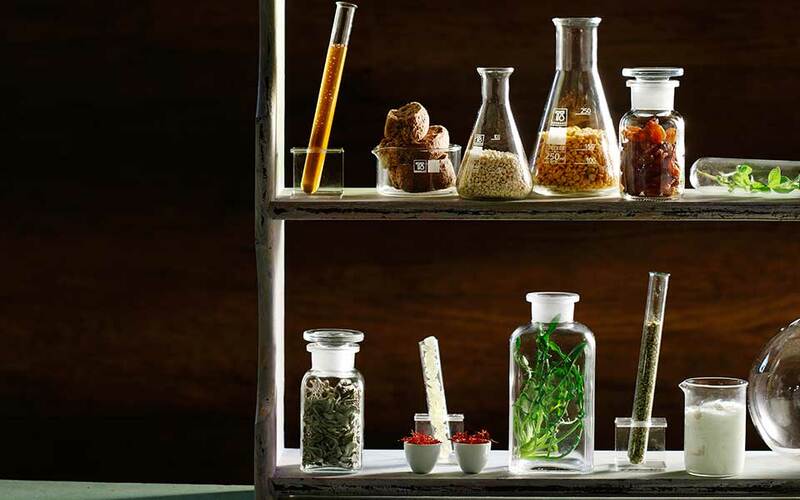 In antiquity, doctors recommended them as a cure for almost anything – from food poisoning to old age! In the late 19th century, Greek raisins accounted for 80 percent of the country’s total exports. Raisins have numerous health benefits: They provide energy; they help fight iron deficiency anemia; they work as an antioxidant; they contribute to the lowering of cholesterol and blood pressure; and their dietary fibers (which outnumber those found in most fruits) facilitate bowel function. 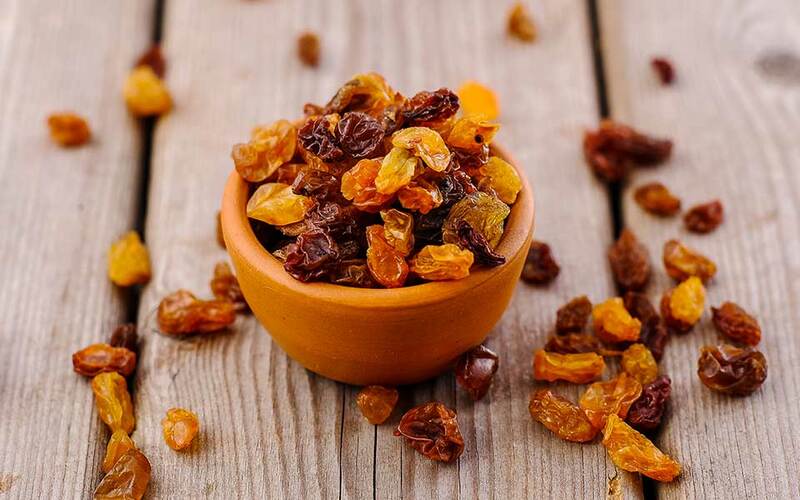 Furthermore, raisins retain their beneficial properties even if exposed to high temperatures – that is, when used in cooking or pastry making. They can be eaten on their own as a snack (two tablespoons a day cover a third of the average person’s fruit and vegetable needs), or they can lend their distinctive taste to a variety of main dishes and desserts. Traces of stored crops and seeds found at Akrotiri indicate that a local species of vetchling, Lathyrus clymenum, was being cultivated on Santorini more than 3,500 years ago. Dioscorides, a famed 1st c. AD physician and botanist, distinguished the plant that provides the specific local fava (yellow split pea) from its relatives in other regions. The particularities of Santorini’s soil, the climatic conditions and, strangely enough, the lack of water combine to create a unique product with a velvety texture and sweet flavor. Rich in protein (20 percent) and carbohydrates (65 percent), the local fava is an excellent source of vitamin B1, iron, copper, phosphorus, potassium and magnesium. Its high fiber content helps maintain normal levels of glucose and cholesterol in the blood, promotes the proper function of the digestive system and helps prevent cancer of the large intestine. And it has just 85 calories/100g. The fava is served in pureed form with lemon juice, oregano and olive oil, and sometimes with chopped onion and capers or with tomatoes and olives. You might also see it in salads, made into patties or even served with seafood such as octopus or anchovies. The mastic tree was particularly popular with the ancient Greeks: its shoots were pickled and eaten as appetizers, while its “tears,” the well-known mastic resin, were chewed to clean the teeth and freshen the breath. These tears were also used to flavor wine. The tree, Pistacia lentiscus, is only systematically cultivated in Greece on the island of Chios, and only on the southern part do the conditions allow for the production of mastic. Prescriptions based on mastic can be found in medical texts dating from late antiquity, when it was already considered beneficial. Present studies have confirmed this. Its antioxidant extracts prevent atherosclerotic plaque from forming on artery walls. Its polyphenols reduce high glucose and cholesterol levels in the blood. Regular use of mastic limits the formation of dental plaque. It helps prevent and treat diseases of the digestive system. It ‘s an all-purpose substance: a powerful anti-inflammatory, an analgesic, a cough suppressant, an appetite stimulant, an astringent and a diuretic. 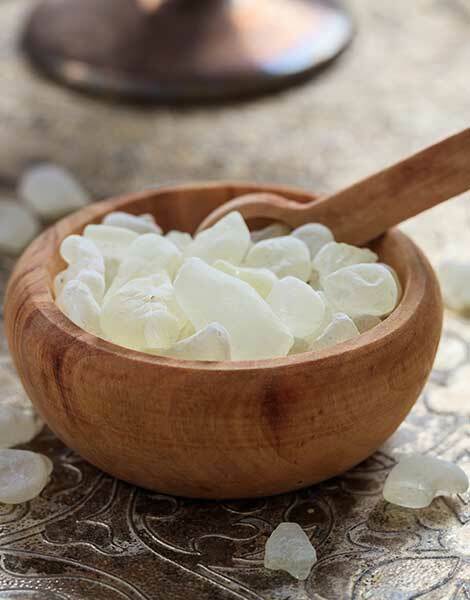 Today, mastic has many uses: as a flavoring for meat and fish, chewing gum, ice cream, sweets and cookies. It is used to make the aperitifs mastic liqueur and, sometimes, ouzo. It’s even used in cosmetics. The resin can be found in a variety of other forms: powders, crystals, mastic water or as an essential oil. According to Linear B tablets, the Mycenaeans showed great interest in precious “sa-sa-ma,” judging by its frequent appearance on lists. This word refers to sesame, that aromatic seed that was already well in use during that period, not only in cooking, but also in medicine – it was used to help heal burns, rashes and various skin conditions, as well as to deal with toothaches and coughs. Sesame – which, like today, was used to garnish bread – as well as poppy and flax seeds, were all widely used around 600 BC, as revealed by the Spartan poet Alcman, who made reference to them. 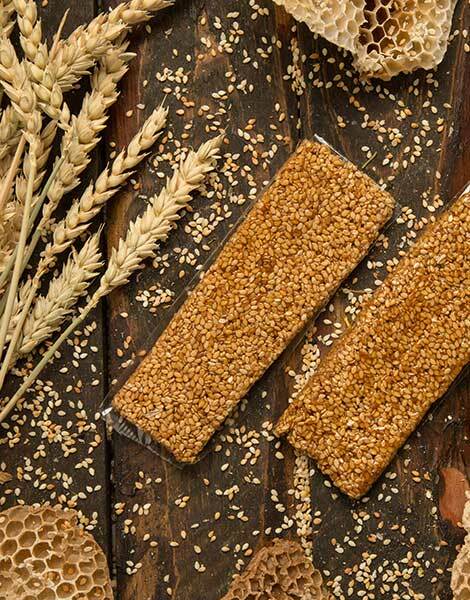 Herodotus (5th century BC) was the first to mention the word “sesamis” – a sweet made from honey and sesame, which was usually offered at weddings. This could be thought of as an “ancestor” of today’s pasteli (a sesame seed and honey confection), which is made in many parts of Greece. Kalamata pasteli is famous, as is that from Rhodes, which is called melekouni. 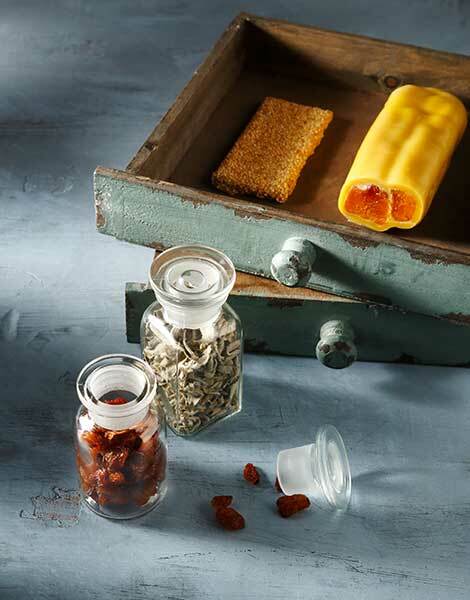 Pasteli is an exceptional source of energy and has great nutritional value, making it an ideal snack. Sesame seeds contain five times the amount of calcium found in full-fat sheep’s milk, and twice the iron found in spinach. They also have antioxidant properties and contribute significantly to lowering blood pressure. …or saffron, is probably the result of efforts to tame the wild Crocus cartwrightianus in ancient Greece, as the plant appears frequently in Crete’s Minoan-era frescoes and pottery, as well as in a fresco from the prehistoric settlement of Akrotiri in Santorini depicting a woman collecting the flowers. 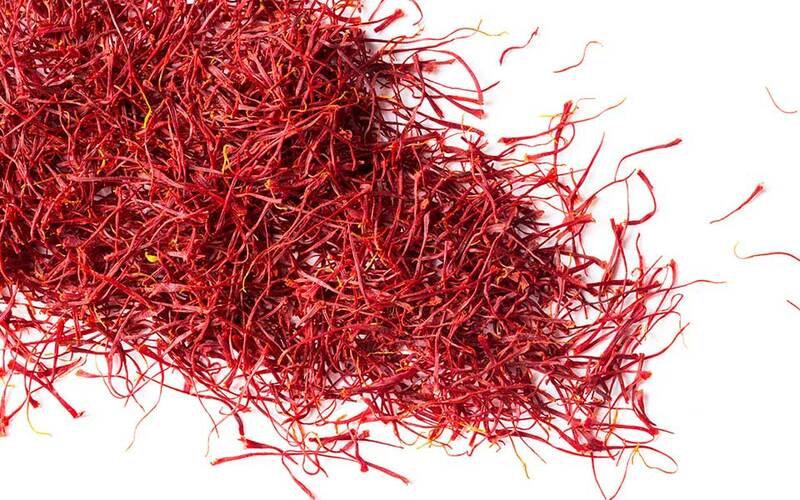 Saffron was widely used in medicine – the ancient Greeks drank it in a tisane to cure sleeplessness and hangovers. Today, Kozani’s saffron is one of the most expensive spices in the world (it takes more than 150,000 flowers to produce one kilogram of the stuff) and is very sought-after for its subtle aroma and flavor, its properties as a coloring agent and its health benefits. Saffron contains vitamins A, C and B complex, as well as iron, calcium, magnesium, potassium and lycopene, which is known to help prevent cancer. It has powerful antioxidant and anti-aging properties, as its carotenoids protect cells from free radicals. It is good for the digestive tract, boosts the metabolism and improves memory and overall brain function. In addition, it helps fight anxiety and acts as a mood elevator. A mere pinch is enough to give food a rich yellow color, a subtle tang and plenty of aroma. It goes particularly well with rice, pasta, white meat and fish; it is used in salads and soups; and it is also used in sweets. It can be found in powder or thread form and as a tea. These greens are a variety of wild chicory (Cichorium spinosum), and have a bitter flavor. They are a key element of Cretan cuisine. The Greek name originates from an old habit the Cretans had of placing these greens over the mouths of water jars to keep bugs out. The stamnagathi plant is a source of dietary fiber, antioxidants, iron, calcium, potassium and vitamins A, C and E, and beta-carotene. It is an excellent tonic and diuretic; it helps to detoxify the liver and has slightly cathartic properties. The ancient Greeks considered it medicinal. The greens can be eaten raw with a lemon or vinegar and olive oil dressing, boiled on their own, or cooked together with lamb or goat. They can also be pickled after parboiling. Yogurt has always held a special place on the Greek table, although it’s also widely consumed throughout the southeastern Mediterranean. The ancient Greeks called it oxygala, and they had a particular liking for it. French explorer Pierre Belon (1517-1564) wrote: “The Greeks and Turks have oxygala, a type of sour milk which they carry in fabric bags hanging off the side of their animals. Though it is quite watery, it stays in the bag without spilling.” There’s been a lot of milk under the bridge since then. 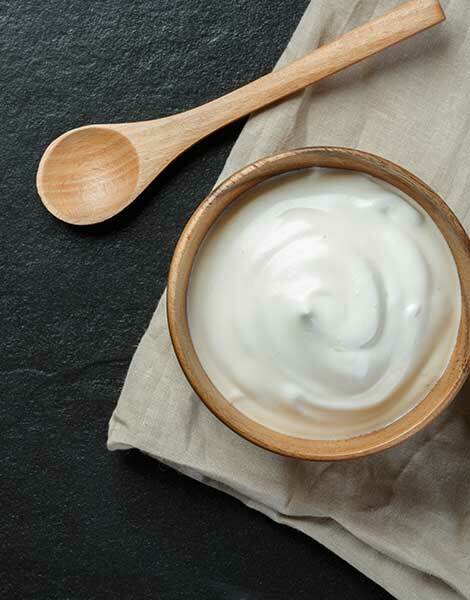 Today, as the food industry strives to offer products with long shelf lives, most yogurt is processed at temperatures high enough to prevent the growth of unwanted microorganisms. However, this means that beneficial live bacteria are also eliminated and yogurt loses a large part of its nutritional value. Traditional Greek yogurt, the one with the skin on the surface, is made from cow’s or sheep’s milk and contains bacteria which have a positive effect on the entire digestive tract. These bacteria include Lactobaccilus, which has been shown to have cancer-fighting properties. Yogurt also helps digestion, provides the same nutrients as milk (protein, carbohydrates, fats, calcium, phosphorus, vitamin B complex and more), and can often be consumed by those who are lactose-intolerant. It is, indeed, an all-round superfood! The ancient Greeks held it to be a symbol of joy and made wedding crowns out of it. But they also knew of its therapeutic value and used it as a drink to treat poisoning, diarrhea and colic, or externally to relieve skin inflammation. Arcadia and Tenedos are famous for their oregano. Cretan folk medicine called for oregano leaves fried in olive oil to make a poultice for back pain, and oregano oil offered relief for toothache. Oregano grows practically everywhere in Greece. Fresh or dried, it adds beneficial properties along with its characteristic fragrance to many dishes. Rich in vitamin C, it also contains calcium, magnesium, zinc, iron, potassium, copper, boron, manganese and vitamin A. The essential oil of Greek oregano is considered the best in the world, as recent studies have shown it to have the highest content in carvacrol and thymol, both of which have powerful antioxidant and cancer-fighting properties. It has antibiotic and antiseptic properties as well. 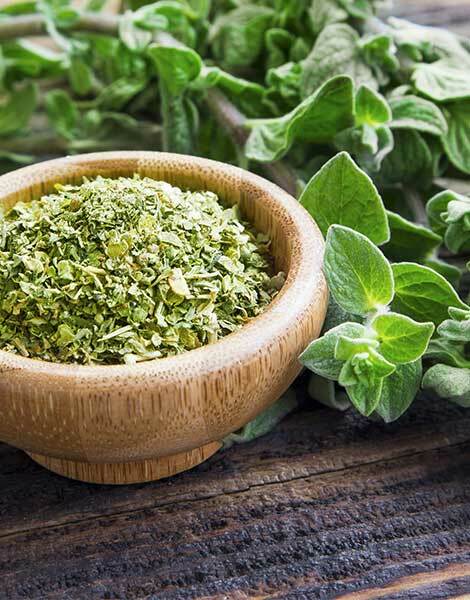 Oregano can relieve intestinal upsets and abdominal pain; it exhibits stimulatory, sudorific and anti-asthmatic effects; it is used to treat flu, colds, gingivitis and sore throat (in a gargling solution). Amazingly, oregano demonstrates 42 times greater antioxidant action than apples, 30 times greater than potatoes and 12 times greater than oranges. Juicy prawns and succulent mushrooms baked with herbs.